Super-strength and super-speed are so passé. 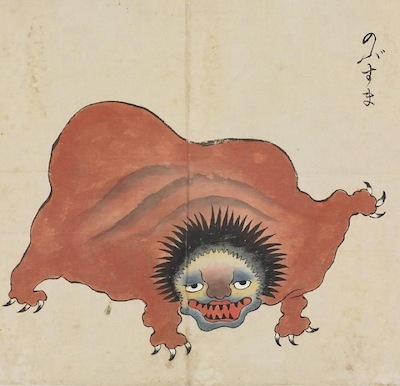 What you need are some Super Cool bits of Japanese demon anatomy. 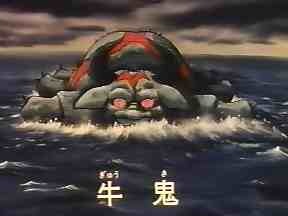 A nasty yokai who loves sinking ships and eating fishermen, the ushi-oni (also known as gyuuki) lives in the ocean. But his Super Cool feature is his skin: when he’s swimming, his skin stretches out to form individual fins and flaps that help him to shoot through the water at top speed. A dedicated wife, the umi nyubou spends much of her time preparing pickled fish (for her children to eat) or gathering sea snake venom (to protect her family from attack by humans). She has a Super Cool digestive system, with three stomachs: one for her, one for her husband, and one for her children. She uses the stomachs like cupboards, storing different food for different people. How convenient! Horse heads that hang upside-down like bats, sagari are said to be the ghosts of horses that died near trees. They eat human blood, and can sense human auras using their Super Cool nose hairs. These moustache-like tentacles can move independently and have also been known to shoot electricity like lightning. A fire-breathing, clairvoyant squirrel, the nobusuma has sharp black teeth and spiky claws. Able to fly, although it has no wings, the nobusuma can blow its body up like a helium balloon, but the power for lift-off comes from his Super Cool tail. By slamming his tail onto the ground, the nobusuma can launch his body into the air. Newton’s Third Law of Motion in action! 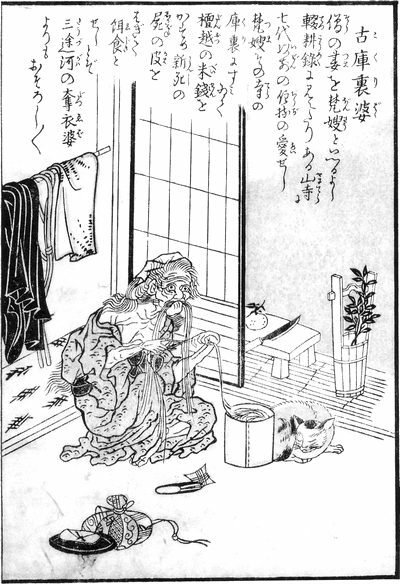 The kokuri-babā lives alone in an old temple and wears a white kimono made of hair. She may look like a frail, old woman, but when she’s hungry, her Super Cool fingernails become as strong as pickaxes, allowing her to rip into old graves to find dead things to eat. 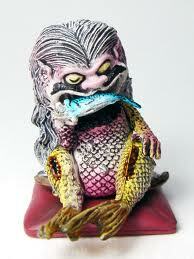 Zig-zag boy is an amphibian yokai who lives in rivers, surviving on raw fish. He has no friends and no family, but he does have one redeeming feature: his Super Cool teeth. 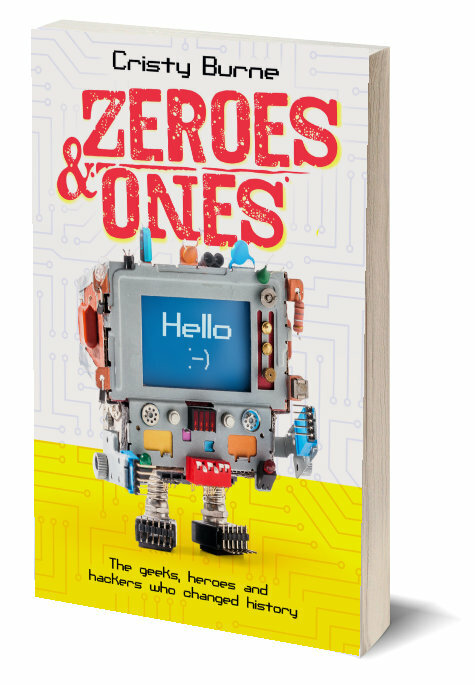 Incredibly pointy and stronger than steel, Zig-zag boy’s teeth allow him to rip into raw fish, tearing them apart. If he loses a tooth, another will grow back right where he needs it. The tortured ghost of a farmer who lost his land, the dorotabou rises from the mud to haunt his old fields. 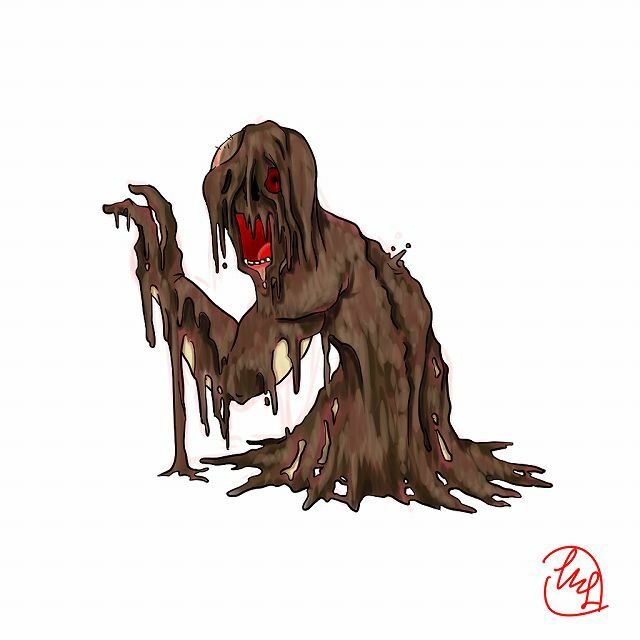 Surviving on leaves, leeches and frogs, this mud-dwelling yokai has Super Cool lungs that allow him to breathe even when submerged in mud. 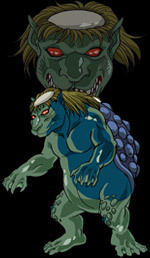 A blood-sucking kappa with the fangs, claws and power of a tiger, the suiko lives in fast flowing rivers. He is an accomplished killer, but also has a softer side: the suiko likes to sunbathe, and he likes to chat. His Super Cool ear is divided into three parts, allowing him to understand Bird Talk, Fish Talk and Human Talk as well as his native Yokai Talk. Thanks to manga and yokai legend Shigeru Mizuki and his awesome reference Yōkai Daizukai for the inspiration. 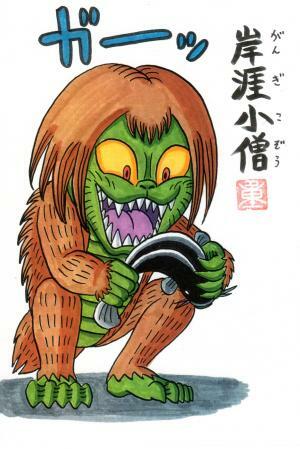 Tags: dorotabo, gangi-kozo, gyuuki, Japanese demons, Japanese mythology, Japanese yokai, kokuri-babaa, nobusuma, sagari, Shigeru Mizuki, suiko, umi-nyobo, ushi-oni, yokai | Permalink.